The Gustavus men's golf team posted a final round score of 302 and finished seventh out of 23 teams at the Twin Cities Classic hosted by Gustavus. Monday's round was played at the White Bear Yacht Club. Ricky Copeland, who fired a final round score of 73, finished 13th individually with a 54-hole total of 77-72-73--222. The Gustavus Black team finished 20th at 325-318-311--954 and the Gustavus White team finished 21st at 317-332--960. 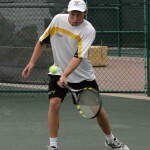 Gustavus Adolphus College won titles in the singles and doubles draws of the Men's ITA Midwest Regional Tournament Sunday in St. Peter, Minn. 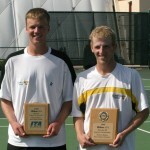 The #1-seed John Kauss of Gustavus defeated #8-seed Charlie Paukert of Gustavus 6-3, 6-2 to claim the singles title. The #2-seeded doubles team of Mike Burdakin and John Kauss of Gustavus defeated the #8-seeded doubles team of Nick Hansen and Kevin Stickney of Gustavus 6-2, 6-2 to earn the doubles title. The Gustavus men's golf team posted a second round score of 301 and moved up into ninth place out of 23 teams after two rounds of the Twin Cities Classic hosted by Gustavus. Sunday's round was played at The Links at Northfork in Ramsey, Minn. Ricky Copeland, who is in a tie for 17th place, led the Gusties with a score of 72. The Gustavus White team is in 18th place at 311-317--628 and the Gustavus Black team is in 21st place at 325-318--643. The Gustavus men's soccer team battled non-conference opponent Simpson College to a 0-0 tie through two overtimes on Sunday afternoon in St. Peter. The Gusties outshot the Storm 21-1, but could not get the ball past Simpson goalkeeper Josh Youngman who made nine saves. Gustavus has now been held off the scoreboard for two consecutive games (a total of 200 minutes). The Gustavus men's soccer team saw its five-match win streak come to a screeching halt with a 2-0 loss to Carleton in St. Peter on Saturday afternoon. The Knights got two first half goals from Paul Pedtke and then held on for the shutout victory. 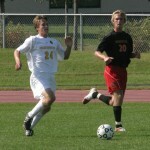 Gustavus falls to 6-2-0 overall and 3-1-0 in the MIAC, while Carleton improves to 9-0-1 overall and 4-0-1 in the MIAC. John Kauss and Mike Burdakin are among several Gustavus men's tennis players to advance to the final day of the Wilson/ITA Midwest Regional Tournament in singles and doubles competition at Swanson Tennis Center in St. Peter. Joining Kauss and Burdakin in the singles semifinal round is Charlie Paukert, while Kauss and Burdakin will face teammates Nick Hansen and Kevin Stickney in the doubles final. Strong defense propelled the Gustavus volleyball team past Hamline University 3-0 (25-23, 25-18, 25-22) Saturday afternoon in St. Peter as the Golden Gusties held a 13-5 edge in blocks. Emily Klein anchored the back row defense with 28 digs as she became the sixth player in MIAC history to reach 2,000 career digs. 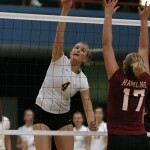 Angela Ahrendt was a force in the middle as she compiled nine blocks and 11 kills. The Gustavus women's cross country team finished 17th out of 36 teams at the Roy Griak Invitational hosted by the University of Minnesota at the Les Bolstad Golf Course in Minneapolis. The Gusties were led by by Brooke Beskau who placed 36th in a time of 23:51. The Gustavus men's cross country team posted a 15th place finish out of 31 teams at the Roy Griak Invitational hosted by the University of Minnesota at the Les Bolstad Golf Course in Minneapolis on Saturday. Dan Foley led the Gustie contingent as he finished 25th individually with a time of 26:30 on the 8,000 meter course.